The words “Metal” and “Fabric” are typically not used to describe the same material, but TexLight is an exception. It is a fabric woven entirely out of metal wires. 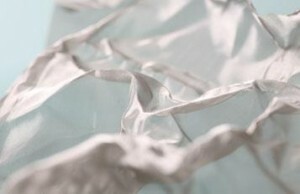 Because of the construction, this material has delicate folds and is malleable like a more traditional fabric. Materials like these have been used in industrial applications for a while, but I think we are just starting to explore the aesthetic attributes metal fabrics can bring to an environment. 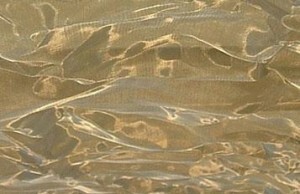 The soft iridescent colored material could be used to make curtains that hold position and can seem to defy gravity. Imagine a sheer curtain that has the great dimensional effect of the end sweeping up at the bottom almost as if there is a perpetual breeze. As an added bonus, this material can be sewn using a standard industrial machine.